Starring Luciana Paluzzi, Kevin Hagen, Jack Weston. Written by Barre Lyndon, based on a story by Hugh Walpole. Skeletons run amok! When Madalena (Paluzzi) believes the skeleton seated in her office is her late husband laughing at her, she beats him into a pile of bones. Fortunately, her lover (Hagen) is able to put the bones back together so they can be resold. But what if there's more to the story than just her imagination? PE: I've got a bad feeling about this. 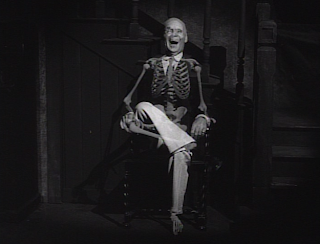 JS: Am I crazy to think that the laughing skeleton pre-credits sequence is one of the best yet? PE: On these two points we agree: it's absolutely the best pre-credits "laughing skeleton" sequence Thriller ever did. And you're crazy. PE: Jack Weston (who will probably be forever remembered as George Stickel in The Incredible Mr. Limpet) is wearing the worst skullcap in the history of cinema. Seriously, his forehead looks like the embossed lines on one of those topographic maps we used to study in Kindergarten. But the skullcap is art compared to the skeleton that Weston examines. How is it he recognizes it as his old friend and not the cheap plastic it clearly is? 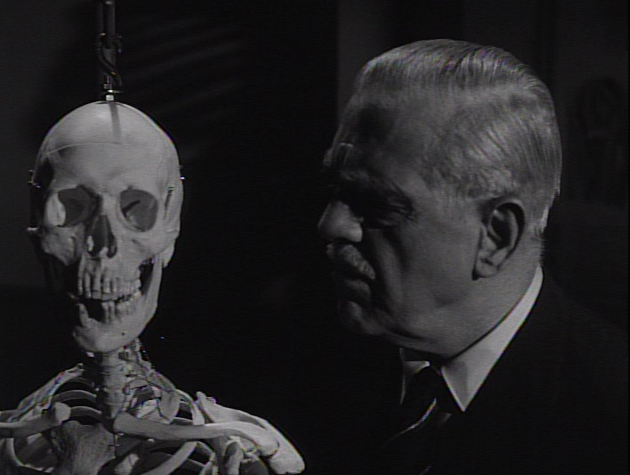 JS: Boris said it best, "To some, the skeleton is a valuable scientific tool. To others, perhaps to you, it is a classic symbol of death." Or did he say plastic symbol of death? 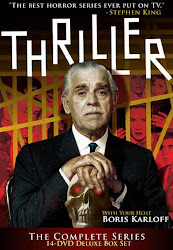 PE: Do you think the weekly Thriller meeting went something like this: "Hey guys, we've been producing some solid horror fare, scaring the wits out of our viewers and getting decent ratings, but I'm not satisfied. No more Weird Tales. Let's get back to the glory days of "Mark of the Hand!" JS: I'm not up on Miss Manners Book of Etiquette circa 1962, but hasn't it always been considered a faux pas to leave a pile of human bones scattered about the floor when you're serving tea? PE: Never mind that. What about that dreadful checkered table cloth? Right then I knew this couple was up to no good! JS: You've got to give Brahm credit, he worked hard to keep that darn skeleton onscreen as often as possible. 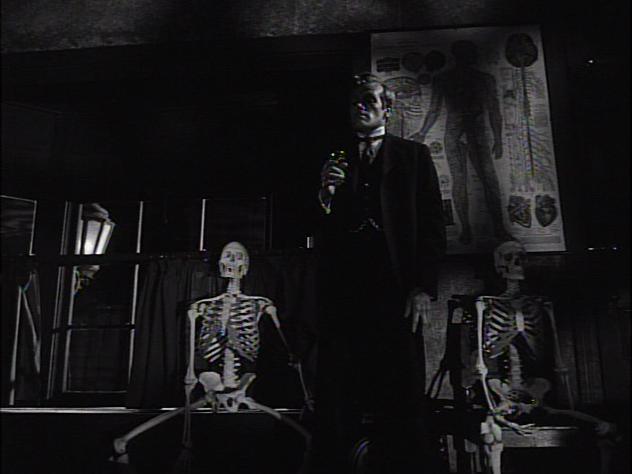 And what's the only thing more interesting than having one skeleton onscreen? You guessed it—having two skeletons on screen! If only the rest of the cast gave such memorable performances. PE: You mean you didn't appreciate Kevin Hagen's four minute death scene? I was disappointed when he didn't reach for Reynard's skull and launch into some Hamlet. Just die already! JS: While this episode was clearly not intended to be a comedy, I think I was able to enjoy it more by viewing it as one. I kept looking forward to where our skeletal pals would turn up next, as if it were titled, "The Skeletons Keep Coming Back." PE: Do you think anyone would have noticed if Image had accidentally left off the last eight episodes of Thriller? 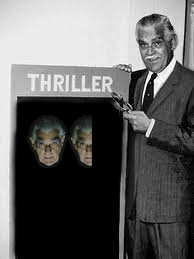 We're going to find out but I'm pretty sure we won't have to pay the Karloff estate for the rent on those three extra Boris noggins this week. JS: Luciana is perhaps most famous for her role as Fiona Volpe in Thunderball. It was also interesting to see Doc Baker (Hagen) from Little House on the Prairie playing a not very nice guy. Oh well, you can't go wrong with alot of skeletons and the big vat that gets rid of your skin. Plus everyone croaks, so that was funny. In fact this had to be a comedy episode. By the way, do we really want to grab hold of the hand of our THRILLER buddies and all run at once through the final episodes? They will get us all with one burst, so we better keep watching one by one until we have the last man standing. The survivor will get Peter's complete set of MANHUNT, in memory of all the crime episodes that we somehow survived. Oh dear, what a mess! A drizzle of the supernatural suggested and then pure crime with a group of cloddingly accented actors. Even Jack Weston, who usually steals the show, just can't lift the material. There's no passion or fire in it at all. Mundane, obvious and therefore inevitably boring. Good photography. There is one crime thriller coming up that's a pleasant little number. Start with 10 Full Karloffs for the creepy, bizarre prologue (whatever material the skeletons were made of didn't bother me in the least). Deduct 6 Karloffs for a plot that fails miserably to deliver on the promise of the prologue. Deduct 3 more Karloffs for the ridiculous mis-casting of Jack Weston as a French aristocrat (and you guys thought Robert Middleton didn't cut it in "Guillotine"!). Add 2 Karloffs for the typical Thriller dark, shadowy creepiness, then throw in 2 more for the wonderful Vladimir Sokoloff (one of his very last performances on film; died in late Feb, '62) and the eerie, torch-lit cistern scene. 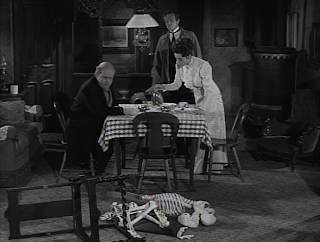 Add another head for the final scene which, though drawn out, still has something deliciously weird and grandiose about it--with Hagen's death speech, Luciana's corpse (with wine bottle alongside) laid out as if displayed at a wake, and the two sentinel-like skeletons sitting in the near-blackness of the little shop. Nice closing. Let's see...that makes SIX laughing-skull Karloffs for this overall disappointment of a show which, despite the fact that it's a major let-down, still manages to offer some excellent, classic Thriller images and atmosphere. Sadly...it's one of the best post-Markesan shows, so enjoy it while you can! What--no love for Luciana? I find her pretty entertaining in this (and, yes, visually), and one of the few bright spots in this...not so great...episode. Being mathematically challenged, I didn't want to add any more factors of the episode to my "equation", lest I totally screw up the addition/subtraction gimmick. Funny, I was going to deduct Six Karloff noggins from your total for your mathematical confusion! Terrific idea that never truly gets to the meat of the matter. That intro reminded me a little of Prisoner in the Mirror's start, with the skeletonal simularities. It had that kind of potential, I think, but became bogged down in too much talk, too much external workings of fear, when it really needed to see Madalena and Arno's tortured dreams... At this stage there seems to be some form of resignation within the production -- resorting to more and more of scores from earlier shows (which in many cases isn't a knock; however, in the manner that we're watching them it does become very noticeable -- that brief determined drum march from Guillotine popped up, along with some that sounded like they were from other shows... There are fewer and fewer shots that utilize the strange, weird and twisted nature of the characters. And the acting in this episode is fairly uneven. Hagen is terrific, Paluzza is incredibly luscious in the period costumes, but Weston mugs and stumbles through a poor french accent, and likely is distracted by that grapefruit peel on his head. How could a story like this be churned into a dull, overlong recital? I'm agreeing that this is one of the more middling productions but the kernel of a brilliant episode lays open. Five and a half Karloffs. Once per Thriller season, Jack Weston is seen running around in a bad bald-cap. I actually jumped twice during this episode. First with the skeleton's off stage scream (loud!) and I think secondly when they opened the closet and the skeleton was standing (loud music!). Otherwise, yes, the promise of the prologue did not pay off in the end. I was waiting for and fully expecting the skeletons to at least laugh maniacally. Too bad the episode just petered out. Hated this, one of the worst 10 episodes, weak performances, its all about whether or not the skeletons are haunted, then they just abandon that and everyone starts poisoning each other. For the most part, I've enjoyed the period pieces from the Thriller crew. Flowers of Evil started off with a strong prologue and carried the haunted skeleton theme through the early stages of the episode. It's unfortunate that the writers decided to drop the boogie bones and focus on the well worn tales of cheating and money scheming. 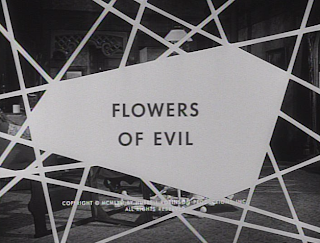 Despite this detour into safe territory I still enjoyed Flower of Evil. Luciana Paluzzi was a sultry femme fatale who played Madalena with lust and enough slight deceit that I believed her passion for Arno was true right up until she added a little flavor to his wine. Kevin Hagen did a good job as a working class lad who wrestled with self doubt at moving up in class with his dream job and maintaining a relationship with a lass out of his league. Jack Weston was great as the gross, socially awkward porker who just discovered a delicious morsel of blackmail. His poisoning scene, while not as good as Robert Middleton's in Guillotine, was still a hoot to watch. After that Mr. Reynard's short and fat skeleton joins Madalena's ex. in the shop I thought for sure we'd get some wacky skeleton hi-jinks. Nope, just good ol' fashioned strangulation and poisoning. I could use some green eggs with Arno's final act. Still, I thought it good fun, especially with his three comrades there to watch the extended agony play out. Two and a half Karloff skeletons for Flowers of Evil. After viewing the Grim Reaper, Count C, when first aired in the early '60s on Thriller et al the others (Price in the House on Haunted Hill, Jason and the Argonauts--phenomenal spec effects), this was not even camp or to use a phrase skeletal. No bones about it! Dreary. And too similar in theme to "Innocent Bystanders" (which in turn was too similar to Karloff's BODY SNATCHERS).